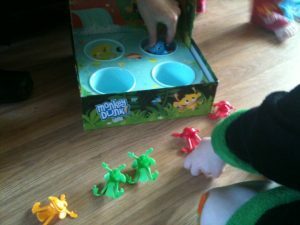 As I said yesterday in my review of Pop Goes Froggio, we love Hasbro games in our house, so I was delighted to get to review another family game called Monkey Dunk. Monkey Dunk is a game aimed at 4 and above, perfect for pre-school ages. Everything comes in the box and you use the box as part of the game. 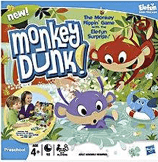 The aim of the game is to Flip the monkeys into the lagoon/box, not knowing when Elefun will pop up out of the lagoon sending some of the monkeys flying. If you get your monkey in the water you collect a banana. The person who collects the most bananas wins. What is perfect about these games is that they are quick and easy to play, perfect for little one’s short attention spans. You can see from the picture below, it is easy to setup and the children have lots of fun playing it. Once they have mastered the game, you can add a lily pad blocker to one of the water holes so they have only three to aim for. The game is sturdy and well made. The inclusion of some numeracy learning skills is a great addition to the game. The players get to add up their monkey to swap for the bananas. I would highly recommend this game to anyone with a pre-school or early school aged child. It is a great game to sit down and play with the whole family. Easy to play and great fun to be had. Disclaimer:- I was sent this product in exchange for an honest review which I have given above.